What happens to two middle-aged spinster sisters in the postwar years when a new vicar arrives in their small English village? For my Tuesday post, I usually provide my Quick Facts about the book I'm featuring. But today I'm going to do something different. I'm excited to announce that I will be the first guest host of the Open Road Twitter Book Club, run by Open Road Media (@OpenRoadMedia), and I hope you'll join in the conversation. 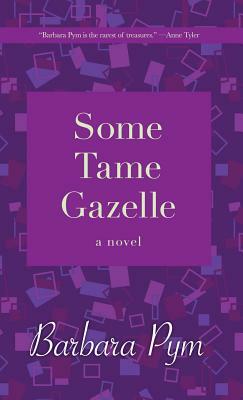 I picked Barbara Pym's Some Tame Gazelle for my book club selection for a couple of reasons. First, and maybe most important, I love Barbara Pym and wish more people read and talked about her books. It's also a great place to start with or revisit Pym because this novel was her first published book (1950) and includes many of her trademark themes: the story features older women, sharp (and witty) commentary on social norms and the minutiae of everyday life, great descriptions of food, and a look at male-female relationships. Belinda and Harriet Bede live together in a small English village. Shy, sensible Belinda has been secretly in love with Henry Hoccleve—the poetry-spouting, married archdeacon of their church—for thirty years. Belinda’s much more confident, forthright younger sister Harriet, meanwhile, is ardently pursued by Count Ricardo Bianco. Although she has turned down every marriageable man who proposes, Harriet still welcomes any new curate with dinner parties and flirtatious conversation. And one of the newest arrivals, the reverend Edgar Donne, has everyone talking. A warm, affectionate depiction of a postwar English village, Some Tame Gazelle perfectly captures the quotidian details that make up everyday life. With its vibrant supporting cast, it’s also a poignant story of unrequited love. I last read Some Tame Gazelle a number of years ago, so I'll be reading it along with you over the next few weeks. I'm confident there will be a lot to talk about when the club meets for a Twitter chat on September 28 (specific time to be announced). The hashtag will be #ereadtogether. One of the reasons I love Pym is her keen observations of the world around her. Her books don't focus on deep subjects but on real life, and many of her themes remain relevant decades after she wrote them. If you decide to join the Open Road Twitter Book Club, be aware that the eBook of Some Tame Gazelle will be on sale in September for $1.99 (that is, the Open Road Media edition). Of course you can read any edition or even listen to the audiobook if you'd like; it doesn't matter. I hope to see you on September 28 for the Twitter chat (#ereadtogether). I think it's going to be a lot of fun and I'm looking forward to putting together some discussion topics to get us started—including what the heck combinations are! Well I've never read Barbara Pym, but you make her sound quite appealing. Maybe I will sign up! This sounds like fun! Josephine Tey has a character called Miss Pym and so I'm always forgetting that there was an author by the same name. I will have to look for her books. They sound like something I'd enjoy. What a great idea! It's been a while since I read a Pym book, and this is one I haven't read yet. If I'm able to fit it into my reading schedule, I'll try to join you. I love the humor in the opening, although the word "combinations" stopped me and I had to think about it before continuing. Long underwear? Best of luck with the Twitter book club! How fun! I love Open Road and have been so pleased with many of the 'older' books that they are bringing back. I've found several favorites. I'm not on Twitter and don't think I can do one more social media thing. However, I wish you luck. Suspect it will be a lot of fun. I'm a big fan of Open Road Media, but didn't know about the book club. Some Tame Gazelle is a wonderful book! I've never read this author but, this one and 2 other books by her sit on my unread shelves. I must remedy this. I'd read more. Oh my, I love this book. A reread with a whole bunch of other Pym readers? Great idea! I've never read Barbara Pym, but I've been curious about her work. I love books set in English villages, especially those that focus on real life. I loved this book, but then I've loved most everything I've read by Barbara Pym! I'm not that big a fan of unrequited love, but the details in the quote really are well done. A novel set in an English village is right up my alley. I do love Barbara Pym and intend to read this one. I have a medical procedure scheduled on the 28th so I may not be able to be online for the whole book club meeting - depends on the time schedule. Congrats on the hosting job. I know you'll make a great one. I'm excited to get started on the book. I've always wanted to read Pym but never knew where to start. Great idea and I like Open Road Media. It's been years since I read the Pym books. You are right: probably time to read them again. My attic might even contain one or two of them. But I can't make it to the conversation. This sounds fun. As does the book. I've not read this author before. I love that opening. I'm already hooked. :-) Thank you for bringing this one to my attention. I don't know if I can make the Twitter chat, but I might have to take advantage of the sale . . .